For Pyrex, the 1980s was a period of product renewal and rethinking. 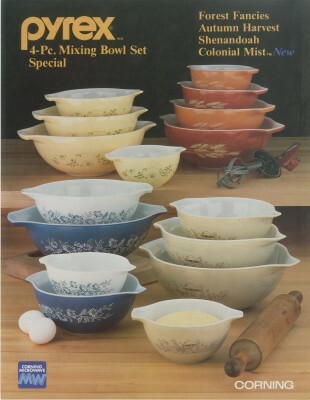 “Pyrex® ware presents new measuring cups and mix ‘n’ measure batter bowl” advertisement from Corning, 1983. Gift of digital image from World Kitchen, LLC. CMGL 144844. The concept for the redesign came from a problem discovered while making 1-piece saucepans. When the saucepan was heat-treated, the handle sagged. While not an ideal shape for saucepans, it was a perfect solution to make more ergonomic handles on measuring cups, and ones that would stack as well! 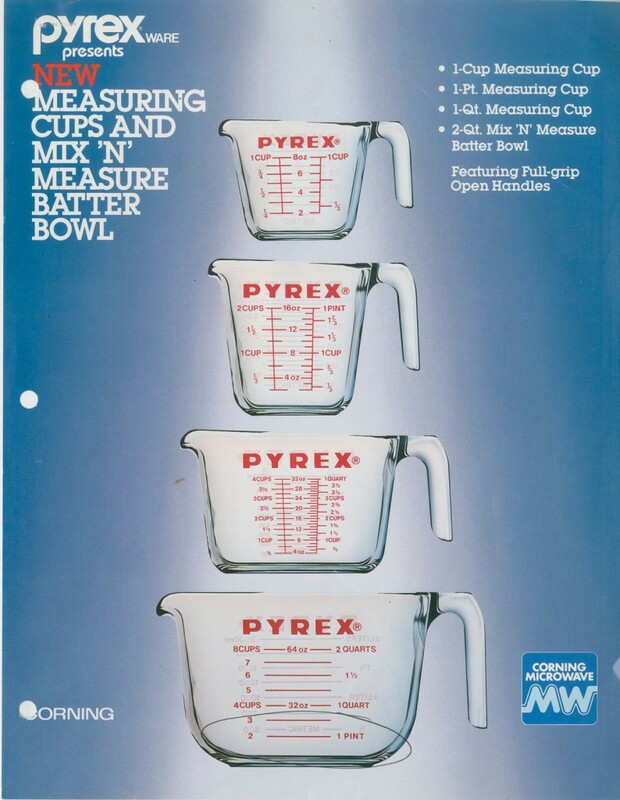 Like all Pyrex ware products, the new measuring cups were sent to the Test Kitchen before release. Younge recalls that focus groups “started producing feedback the moment the respondents walked into the Test Kitchen and saw the proposed cups on the counter. Even before they had taken their coats off, they were handling the new cups and asking if they could buy them.” Based on these sessions, tweaks were made to the final design and, in 1983, the new measuring cups, along with a 2 quart Mix ‘N’ Measure Batter Bowl, were released. Pyrex liquid measures proved a success, with sales skyrocketing 150% over the previous year. “Corning Micro-Wave products” brochure (CB-143 9/80MA) from “Corning 1st half 1981: product specials, new products, nat. advertising, sales promotion” advertising packet. Published by Corning Glass Works, [1980-1981]. CMGL 119030. Pyrex Microwave Ring Mold with Original Box, made by Corning Glass Works, Corning, NY, 1980s. 2010.4.797. Microwave products, however, were not the only lines coming from the Pyrex brand. 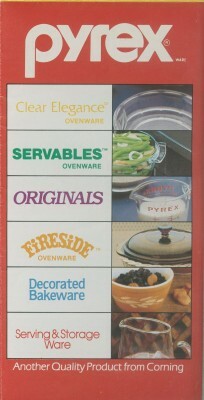 A Corning Glass Works booklet from 1984 shows these other product lines: Clear Elegance™ Ovenware; Servables™ Ovenware; Originals; Fireside™ Ovenware; Decorated Bakeware; and Serving & Storage Ware. This booklet clearly demonstrates a return to transparent Pyrex ware with Clear Elegance™, Servables™ and Originals. A variation was Fireside™ with a “rich, warm color” of a transparent brown. Fireside™ accessories included woven baskets and metal cradles with homey prints. The 1980s saw the last designs of Decorated Bakeware, Pyrex’s beloved opalware line. The last four patterns produced were Autumn Harvest (debuting in 1979), Shenandoah and Forest Fancies (debuting in 1981) and Colonial Mist (debuting in 1983). Production of Decorated Bakeware ceased in 1986.